In July of 1495, a young man arrived at the Scottish court of King James IV who claimed to be Richard, Duke of York, one of the young sons of King Edward IV of England. The Duke of York and his elder brother, King Edward V had disappeared after being lodged in the Tower of London in 1483 following their Uncle Richard III’s proclamation as king. 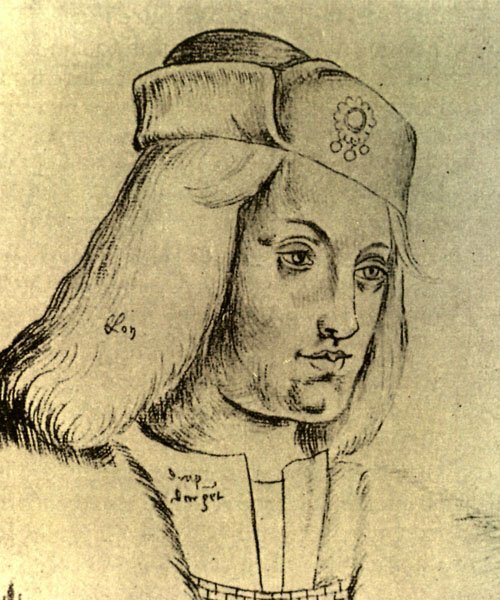 Whether James IV believed this man was the Duke of York or not, he saw the possibilities of using him as a pawn in his political negotiations and international alliances. He genuinely liked this young man and they became fast friends. James received the supposed Richard with all honors, treated him like a king, dressed him as a king, gave him a pension and took him on progress throughout the kingdom. He also gave him his cousin Lady Katherine Gordon as a wife. In January of 1496, “Richard” and Katherine were married and she was now known as the Duchess of York. After the ceremony, there was more celebration, including a jousting tournament in which the king himself participated. After the tournament, the couple traveled to Falkland Palace in Fife and James made plans to go to war with England with “Richard” as his ally. In September of that same year, James raided Northumberland but returned to Scotland after only three days. No one in England rose up to support the supposed Duke of York. In the meantime, the spies of King Henry VII of England had found the true identity of Katherine’s husband. He was the son of a boatman of Tournai, a city in what is now Belgium and his name was Pierrechon de Werbecque or Perkin Warbeck as Henry called him. Warbeck spent a period of nearly two years in the Scottish court. Perhaps James began to tire of him. He was trying to negotiate a marriage to King Henry VII’s daughter Margaret and Warbeck was seen as an obstacle since Henry wanted to get rid of the threat Warbeck posed to his throne. In the summer of 1497, King Henry had implemented a tax to raise funds for war against Scotland. The people of Cornwall found the tax excessive and a rebellion started. Warbeck considered joining the rebellion and making another bid for the English throne. James outfitted him with a ship and Katherine, Warbeck and their son set sail. Katherine and Warbeck sailed to Ireland first and spent about a month there trying to raise troops. It became obvious there was no support for their cause so they sailed for Cornwall, landing at Whitesand Bay. Warbeck declared himself king and called for supporters. On the way to Penzance it is believed he left Katherine in St. Buryans at the halfway point. There is some confusion in the records. Another citation has her left at St. Michaels Mount. Either way, she was safely away from any action and would remain so for about five weeks while Warbeck gathered troops and went into battle. King Henry VII’s army came after him and after slowly losing support, Warbeck fled for sanctuary at Beaulieu Abbey in Hampshire where he eventually was persuaded to surrender in October of 1497. He was put under strong guard. King Henry’s forces came to Katherine who was found wearing the clothes of mourning. She may have lost her son or miscarried. There is a mention in a Welsh chronicle of a son called Richard Perkins. Perhaps the son was left behind in Ireland? She had to be persuaded to surrender and the king’s men made it clear they would deal with her kindly. She was brought to Exeter where King Henry met her in person. Henry was particularly concerned Katherine was pregnant and the whole Warbeck affair would be never-ending through her children. But she wasn’t pregnant. The chronicler Bernard Andre describes a meeting between Henry VII, Warbeck and Katherine. Henry met with Warbeck first and told him he would spare his life. Katherine then entered the room looking particularly beautiful. Warbeck confessed his true identity to her. Henry promised his Queen would look after her. Katherine wept and expressed her disappointment that Warbeck was not who he said he was and said she placed herself in the hands of the king. Henry complimented Katherine on her dignity and high birth and said she deserved a man of higher rank. Andre hints Henry may have been smitten with her. Henry treated the couple fairly well but wouldn’t allow them to sleep together. Katherine was either forbidden or chose not to return to Scotland and resumed her maiden name. Henry outfitted her with horses, food and clothing and she traveled to the royal palace at Sheen. Queen Elizabeth accepted her and gave her a pension and a high place in her household according to her rank. In June of 1499, King Henry and Queen Elizabeth went to Calais to meet Archduke Philip who had married Juana of Castile, sister of Katherine of Aragon. Katherine Gordon accompanied them on this trip. On November 23, 1499, Perkin Warbeck was executed at Tyburn for conspiring against the king and Katherine became a widow. In January of 1502, the treaty of marriage between King James IV of Scotland and Margaret Tudor was finalized at Richmond. There was a betrothal ceremony the next day and Katherine was among Queen Elizabeth’s ladies and took precedence at the royal party. Queen Elizabeth died in February of 1503. At the funeral, Katherine was one of the chief mourners. She took her place in the procession from the Tower of London to Westminster behind the Queen’s sister and she laid her pall on the coffin in Westminster Abbey after the Queen’s sisters. After Elizabeth died, Henry kept Katherine by his side. The royal accounts give evidence he relied on her for support for the rest of his life. She played cards with him and got medicines for him when he was ill. She painted cloths with religious scenes to be held before him as he lay ill and dying. But he didn’t marry her and there is no evidence of impropriety between the two. Payments appear in the records of 1509-1510 indicating she was one of Katherine of Aragon’s ladies when she was Princess of Wales. Shortly before Henry VIII became king, Katherine received grants for land in Berkshire upon her promise she would not leave England. Sometime between 1510 and 1512, Katherine married James Strangeways who was a Gentleman Usher of the King’s Chamber. Strangeways died in 1516, leaving all his property to Katherine. In July 1517, Katherine married a Welshman named Matthew Craddock, a gentleman and knight of Glamorganshire. She obtained leave to live in Wales. Katherine was employed in the household of Henry VIII’s eldest daughter Mary Tudor from 1525 to 1530 as a Chief Lady of the Privy Chamber. Craddock died in 1531, naming Katherine the executor of his will and leaving her income from some of his property in Wales and 500 marks. Katherine married another Gentleman Usher of the Chamber named Christopher Aston sometime before January 1536. The last six years of her life were spent on her lands in Berkshire where she was regularly seen riding horseback around the parish. Katherine died on October 14, 1537. In her will she never mentions her first husband or any children. She calls herself the “sometime wife” of James Strangeways, referred to Craddock as her “dear and well beloved husband” and Ashton as her “beloved husband”. She left clothing to Margaret Kyme, the daughter of Cecily Plantagenet, to her servant Philippa Huls and to another woman she refers to as her “sister”, Alice Smyth who may have been the sister of Craddock or Ashton. Katherine was buried in the chancel of the parish church of Fyfield in Berkshire where there is a tomb with missing brass figures that is still referred to as “Lady Gordon’s Monument”. Ashton outlived Katherine and died in 1561. Susan Abernethy is the writer of The Freelance History Writer and a contributor to Saints, Sisters, and Sluts. You can follow both sites on Facebook (http://www.facebook.com/thefreelancehistorywriter) and (http://www.facebook.com/saintssistersandsluts), as well on Medieval History Lovers.